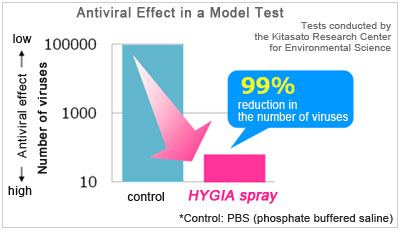 From the TOP HYGIA brand and its “Prevention Concept,”1 a New Product that Eliminates Bacteria, Viruses and Odors2 from Clothing and Fabric with just a Quick Spray! Lion Corporation (President: Itsuo Hama) announces the September 25, 2013 nationwide release of TOP HYGIA Fabric Refresher antibacterial, antiviral deodorant, the latest product in the TOP HYGIA liquid laundry detergent brand lineup, which offers a “prevention concept” entailing enhancing the antibacterial properties of laundry through washing3 and preventing the growth of bacteria and formation of odors. With just a quick spray, the new product eliminates bacteria, viruses and odors clinging to clothing and fabrics. Concerns have been growing in recent years with regard to such “invisible threats” as outbreaks of new strains of influenza and rubella as well as pollen and other fine particulate matter. In step with the rise in related consciousness of prevention and hygiene, the market for hand soap, surgical masks and other prevention-related products has expanded year after year. Increasing numbers of people are worried about pollen, bacteria and viruses on their clothing and about carrying these threats into their homes on their clothing. This rising concern about the invisible grime on clothing is reflected in growing demand for antibacterial laundry detergents (Lion surveys). In 2012, Lion introduced the super-concentrated liquid laundry detergent TOP HYGIA, which has been well received by consumers. 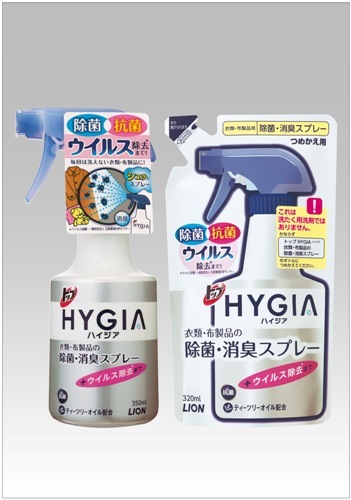 The TOP HYGIA “prevention concept” entails enhancing the antibacterial properties of laundry through washing and preventing the growth of bacteria and formation of odors. Applying the results of research conducted at its Fabric Care Research Laboratories regarding the removal of bacteria and viruses from clothing, Lion is now introducing TOP HYGIA Fabric Refresher antibacterial, antiviral deodorant, which eliminates bacteria, viruses and odors from clothing and fabric with just a quick spray. This new spray is ideal for a wide array of uses, including on outerwear items like coats and jackets that bacteria and viruses seem likely to attach to, items that cannot be washed frequently, such as curtains and sofa covers, and to deal with odors from wet clothing hung to dry indoors. Contains tea tree oil, a well known traditional healing agent. Contains the same refreshing minty green fragrance, featuring a blend of natural peppermint and spearmint, as TOP HYGIA liquid laundry detergent. Although immediately fragrant when sprayed, the scent quickly dissipates and does not linger on clothing.